Wisconsin youth rank fifth in the nation for volunteering, with 40% of youth active in their communities. Here at The Road Home, we see the difference youth can make. A recent national study found that the desire to do good and make a difference in their communities is at an all-time high among US youth. Today’s youth volunteer and give more frequently than youth in the 1970s and 1980s. And youth in Wisconsin are leading the pack. While national volunteer rates for high school students are just under 30%, the rate in Wisconsin is almost 40%, putting it at #5 for states with the highest percentage of youth active in volunteering. In Wisconsin, nearly 25% of youth donate to nonprofits compared to a national average of 16% of youth. Yet growth in volunteering and giving among youth has stagnated in the last decade, even as youth who say helping others is a priority for them has continued to grow. This has led many to believe that given more opportunities, youth in our communities have the energy and desire to make an even greater difference than they already are. Here at The Road Home, we have seen the impact youth can make. 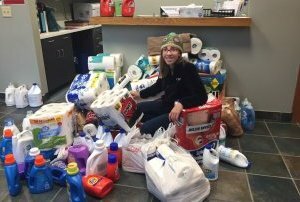 Wish list drives are a great way for youth to help families in our community. 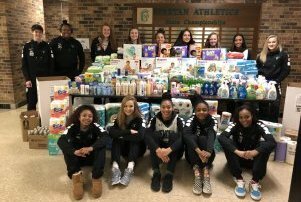 Just this month, the Madison Memorial Girls Basketball team held a wish list drive in which they collected toilet paper, cleaning supplies, diapers, shampoo and other items. The Trinity Irish Dancers also recently held a wish list drive, donating hundreds of items as well as $1200 in gas cards that enable families to drive to job interviews or take children to medical appointments. Thank you to these and other local youth who are helping us reach our goal of making sure every child in our community has a home. We’re Turning 20 Years Old This Year! Click to sign up for our e-Newsletter!